I have great difficulty in removing cutters from my router. I undo the collet nut completely but the cutter still seems jammed in the collet and I have to force it out by levering or tapping it. Can you help please? In ninety-nine cases out of a hundred, the answer is simple. You have not snapped the ‘thimble’ part of the collet into the collet nut. You may not even be aware that with many two-part collets this is essential. 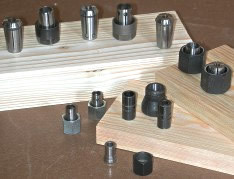 To explain this further, many of today’s routers have a two-piece collet consisting of a tapered ‘thimble’, and a collet nut with a shoulder machined inside it. When a cutter is inserted and the collet nut is tightened, the thimble is forced down in a matching taper in the motor shaft where it contracts and grips the shank of the cutter. Examples of such collets are to be found in the De Walt 625, the Trend T9 and T5, the Perles 0F808, the Freud 2000 and many others. With these collets, it is absolutely essential that the collet thimble be snapped firmly into the collet nut so that the shoulder on the thimble compresses and clicks under the shoulder in the collet nut. If this is not done, the cutter can be inserted, after a fashion, but will remain with the thimble in the motor shaft when you try to remove it. The trouble is that some routers come with their collets dismantled, and the thimble is never installed properly. In addition users might pull the thimble out of the nut for cleaning and not snap it right back. The situation is complicated slightly by the fact that some routers e.g. Bosch 900 and 1300, De Walt DW62 1, have the two-piece collet system but the thimble is embedded in the collet nut by the manufacturer. With these collets the thimble cannot be removed for cleaning or changing and the problem of stuck cutters should not apply. A different cause of stuck cutters occurs sometimes with little routers such as the Black & Decker KW 800 and Bosch 500, where the collet is two-part but the thimble does not snap into the collet nut. Such collets can occasionally jam in the motor spindle, especially if the cutter shank is scratched or slightly burred at the top. The immediate solution is to tap the cutter lightly, rotating the collet between taps. An alternative is to try gently levering the cutter out with two screwdrivers, but the proper cure is to replace the collet and discard the cutter if the shank shows severe signs of wear. It also helps to make sure that when you insert the cutter, the full length of the collet is gripping the cutter shank. A secondary problem related to the first is that the ‘snap-in’ design of collet requires two bites of the spanner to release the cutter. The first bite releases the initial friction of the nut, after which you can take several turns of the nut with your fingers before it tightens up again. What has happened is that the shoulder in the nut has come to bear against the shoulder on the thimble, but cannot pull over the thimble because the cutter shank prevents the thimble compressing. You need to apply the spanner for a second time to pull the collet up out of the tapered motor shaft. The collet nut now, in effect, acts as a miniature hub-puller. This need for two bites of the spanner is my second most frequently asked question. Always insert the cutter into the collet as far as it will go, but do not ground the shank of the cutter on the bottom of the motor spindle or you will get vibration through the motor which will give a poor cut and might loosen the cutter. Tighten the collet nut firmly without wrenching it. Avoid any white-knuckle stuff. A collet that seems to require excessive tightening should be replaced. Do not tighten a collet, even just firm hand tightening, without a cutter in it or you might cause distortion or metal fatigue. Do not leave cutters in the collet. Try to remove them after a day’s work or the collet might suffer distortion, metal fatigue, corrosion, or all three. In the long run collets are consumable items. If you have doubts about your collet, replace it. It will be a lot cheaper than having to replace damaged cutters.